What did i say yesterday about wild swings? Whoever predicted the 1PM turnaround before market open was a true psychic... Lots of talks to try and reassure the market, lots of intervention from central banks, and high volatility on witching day... enough to want to stay on the sideline! Anyway, no rest for the braves, so let's have a look at the situation for today. Now what's coming next? Well it's going so fast that we have to watch lower time frames. Resistance level there is 1234 and 1250. 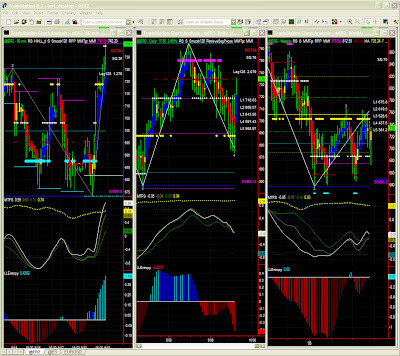 A lot of operations due to witching day pushed prices away from equilibrium which will be found early today. Coming back to our regular segment analysis, even if we jumped a few yesterday, we are now in the 1219-1235 segment, so we'll watch the 1219 support level holding in case of substantial profit taking. Taking into consideration that segments can themselves be split in two, we also have an intermediate level at 1226. ER: I have no superlatives for yesterday afternoon price action... All very similar to ES, so i won't repeat myself. We'll watch 719 holding in case of some substantial (and perfectly rational) profit taking today. Ultimately, when things cool down, we'll have to clearly pass 750 to call these volatile moments 'history'. For the time being, let's just follow intraday time frames. 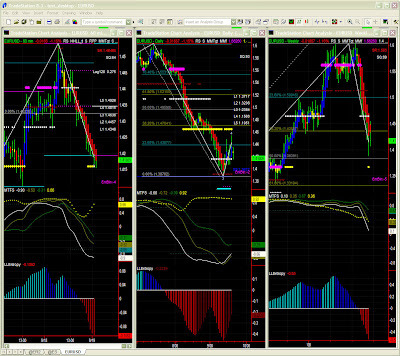 Again, 719 will be key level for today's market direction. In case of some congestion, we'll watch that ER stays in the same price segment. 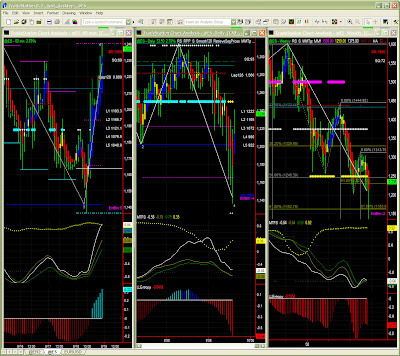 Now we have a pattern that is trying to complete while prices are now sitting on a 1.461 pivot. The downward momentum could take prices a little lower or stay a little above pivot level until ready to bounce. There is some downward pressure on the daily chart waiting to dissipate.